The Floating Nature´s Observatory of Amazonia [FNOA] would give the inhabitants of each specific region of Amazonia and as well the visiting tourists the opportunity to experience the profound and complex beauty of the changing nature in different locations throughout the year. The FNOA would as well provide one of the most advanced investigation centers in the heart of Nature by being able to get submerged into it. The inhabitant, the scientist and the visitor will be able to get as close to nature as ever possible. The Project is based on the realization of the observatory along the river system of the Amazonas, the heart Amazonia, defined by floating platforms that compose a connected port-net with several anchor points in different areas of Amazonia in the passing through the three countries of Brazil, Colombia and Peru. The Observatory arises from the first need and thought towards maximal sustainability and minimal intervention in natures realm. Along the Amazonas there are unfortunately many abandoned ship structures which contaminate continiuously and very profoundly the water and its surrounding. Therefore this ship structures are re-collected and recycled for the first FNOA and the following floating platforms with different programs. The floating platforms are recycled Vessels which get adapted to the following needs of separated anchored programs. This problem of abandoned vessels that are a current severe contamination for al natures realm in Amazonia is getting solved by this project since there will be more and more recycled floating platforms throughout the upcoming years. The anchored programs were located in their most efficient and related environment studying the zones with their specific valuable contribution. The floating platforms are usually anchored to specific ports but eventually change their location. The proposal focuses on the following five arguments: Natures Enviroment, Mobility, RRR Recycle Reduce Reuse, Water Supply and renewable Energy and Spacial Flexibilty. 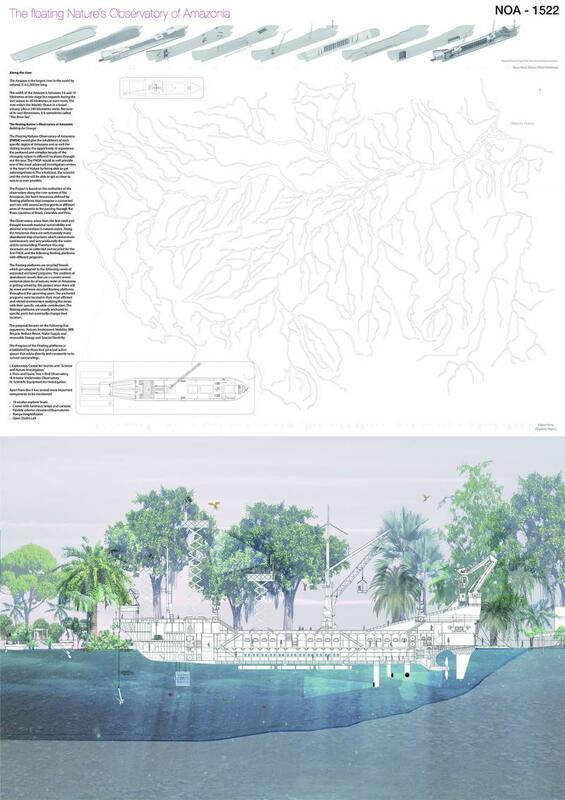 The Program of the Floating platforms is established by these four principal active spaces that relate directly and constantly to its natural surroundings.